Days before Hurricane Sandy hit the coast, local news stations were reporting that Buffalo and the surrounding areas could be without power for five to seven days. We definitely wouldn’t get the brunt of the storm, but forecasters were guessing that the high wind speeds – predicted as high as 70 mph – would cause plenty of damage for our area. I suddenly realized that we were not prepared. All of our flashlights had dead batteries. I wasn’t sure in which box my extra candles were packed. The cupboard was bare. I began jotting down things that needed done on a whiteboard. My eleven-year-old immediately stepped up to help, and her younger siblings followed suit. 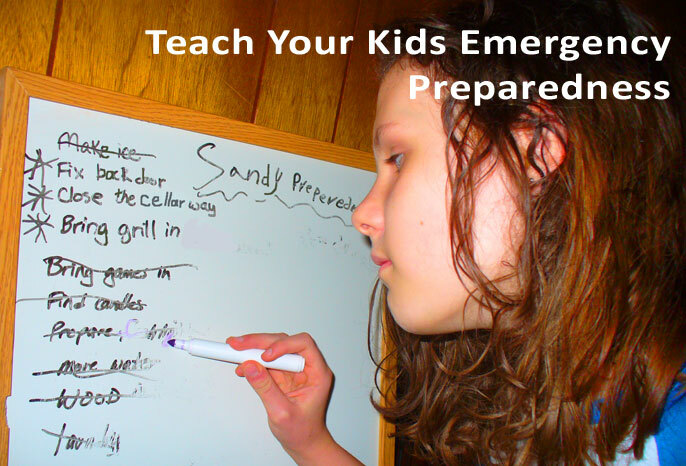 Hurricane Sandy had become an opportunity for homeschool lessons on emergency preparedness. We gathered all of the flashlights, a battery-powered lantern, and three candle lanterns. We found the box of candles and made sure that the lighter was in an easily accessible location. We filled six two-liter bottles as well as our cooler with water, since our well is electric. We even filled the tub with water for cleaning purposes or to use in the toilet tank. I gathered all of the blankets, just in case the gas went out, too. We gathered rain-soaked wood and piled it in the mudroom to dry in case we had to use the grill to cook or keep warm. We froze two bottles of water and placed them in the fridge to help keep our food supply cool. We charged the Kindle and laptop. 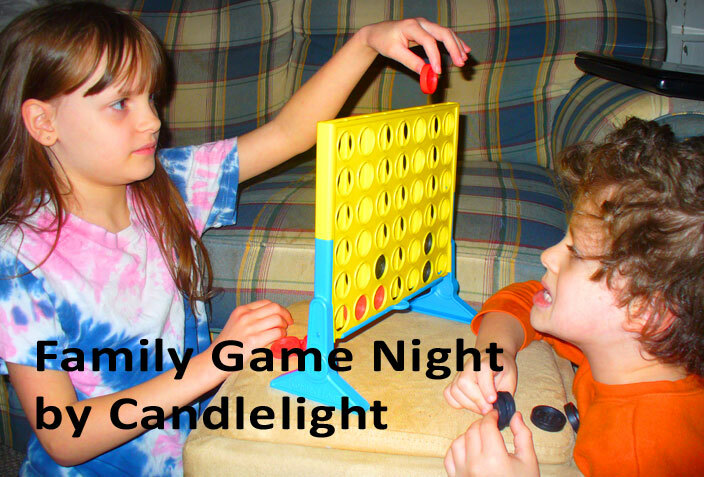 We brought a stack of games into the family room in preparation of family game night by candlelight. Then we texted Daddy a list of items to pick up on the way home, including various battery sizes and food that didn’t require refrigeration or heating up. All that was left to do was to wait and watch the weather channel. The rain continued. The wind blew. But Sandy had done so much damage upon making landfall that she didn’t have much energy left for us. Lake effect winds are typically more powerful than Sandy was, and our lights never even flickered. We were all very thankful. However, those last-minute preparations made me think. We should be more prepared for natural disasters or other emergencies. The life skills we learned that day were a great homeschool lesson. While teaching about the Earth and weather, such as with Christian Kids Explore Earth and Space, you can easily integrate a lesson on preparedness, especially while explaining the lessons on earthquakes, tornadoes, or hurricanes. Discuss with your children the importance of being ready for any emergency, particularly one that might cause a power outage. The Red Cross recommends making a 72-hour kit for each family member that contains non-perishable foods, drinking water, medicine, and even books or a special toy for the kids. You can search the Internet for different items that you can include in your kits and Pinterest includes many examples of homemade kits as well. Take the time to talk about what it may be like without electricity for a long period of time and perhaps even have a practice night – or even for an entire day. While discussing emergency preparedness with my children, we made comparisons to life in Colonial America, a lesson that we had recently concluded. After all of our hard work preparing for Hurricane Sandy, my children were a little disappointed that we didn’t even have an evening without power. They were proud of how much we had accomplished and were not in the least frightened. We looked through photos posted on the Internet that showed the devastation from Sandy in Long Island, New York, New Jersey, and other coastal areas. We prayed for those who had to leave their homes, those who were without power, and those who were not prepared. Being informed and in control beats being unprepared every time. And it goes to show that most any life experience can be turned into homeschool lessons. This is an awesome idea. It teaches so much more than just emergency preparedness – organizational skills, planning, etc. We are retired militray and have lived in several different places around the world and have lived through a couple of emergencies of different types. I am hoping what we have taught our kids through these helps make them more prepared adults.